Samsung Galaxy Tab S is one of the most powerful Android tablets available in the market today, however, it’s not free of problems, glitches and errors. 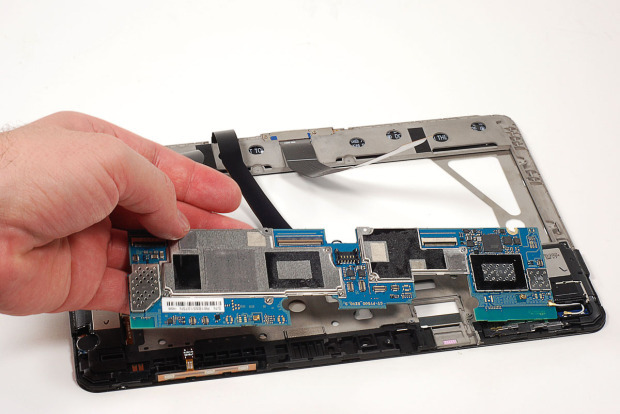 This post is the first part of our Samsung Galaxy Tab S troubleshooter series that will tackle the most common issues, provide helpful solutions and answer questions any owner may ask. There are two variants of Tab S, the 8.4-inch and 10.5-inch models. Both will be supported in this series so if you own one, I urge you to follow this series as we will be publishing support posts every week. Feel free to contact us at [email protected] if you have questions or problems. You may also post on our Facebook wall or Google+ page as we also use them to support our readers. What we ask of you are details. Include all necessary information when you contact us so that we can accurately assess your issues. Troubleshooting: Gener, it seems like one of the apps you installed is causing this problem. But in order to confirm that, try to boot the Tab S in Safe Mode and observe closely how it behaves. If it were a third-party app causing this problem, then the device should not freeze in safe mode, otherwise, it’s an issue with one of the pre-installed app or with the firmware itself. If one of the downloaded apps is the culprit, find that app and uninstall or disable it. However, if the issue is with the pre-installed app or the firmware, then the best option you have to reset the tablet to its factory defaults. I understand you already have a lot of apps in it but if that’s what it takes to fix the problem, then it’s worth it. Troubleshooting: This problem may boil down to just one app glitching. Before you can fix it, you need to verify if it’s a third-party app causing the problem or one of the pre-installed apps. To do that, boot your tablet in safe mode and observe if it would still shut down randomly. In safe mode, all third-party apps and services are temporarily disabled. So, you can easily isolate the problem. If the tablet still shuts down, then the culprit is either one of the pre-installed apps or the firmware itself is glitching. However, if the problem won’t occur, then you just need to find the app that was causing it and uninstall or disable it. Of course, it would take time to find the app if you weren’t observant enough as to what app you were using when the problem occurred. But I suggest you start disabling apps you installed when the problem first started. In case the problem is with firmware or its default apps and services, then backup your data and perform factory reset via settings. Solution: The cause of this issue is either a hardware or a minor firmware glitch. But of course, there’s always the possibility that an app is causing the modem for freeze or the firmware to act crazy. If you want to know a little deeper what the culprit is, try entering safe mode. If the WiFi switch is still grayed out, then it’s a firmware glitch, otherwise, one of the downloaded apps is the cause. Problem: Hello guys, I hope you can help me with my problem. I own a Galaxy Tab S (10.5 inches model). It’s pretty new so I’m still learning everything I can, not to mention it’s my first Android device. I am old and not tech savvy so, I really could use your help on this. I have a lot of pictures and videos saved in this tablet and many of them just disappeared. I can access the device’s storage without problem as well as my 64GB microSD card and I’ve opened every possible folder but they’re not there. I already had someone take a look at this but he, too, didn’t know where to find my lost pictures and video clips. He said that I may have deleted them but I didn’t… I’m sure I haven’t deleted them. Solution: Perhaps, the reason why you cannot find them is because they’re hidden or was tagged as “private.” I, too, was thinking that may be you have deleted them until you said that you noticed an icon in the left side of the pictures that disappeared. I am 90% certain those pictures or videos were hidden. Don’t ask me how they were hidden or who hid them because I honestly don’t know. But assuming they were just hidden and not deleted, you can find them by turning on Private Mode. Galaxy Tab S has “Private Mode” that allows the owner to hide pictures, videos or any file. Enable it and you will find all hidden files that were tagged private. Tap Settings and touch the Device tab. Under Personalization section, find Private mode and tap the button to enable it. You may be prompted with a password or a PIN to continue. Once confirmed, Private Mode will be enabled and you can now find your pictures and videos in the Gallery. Again, I don’t know how they were hidden without your knowledge but if someone else is using your tablet, then he/she must have done it. Question: Hi droid guy. Last night, my Galaxy Tab S 8.4 was working just fine and I was even playing Real Racing 3 with it. I may have fell asleep while gaming and when I woke up this morning my tablet is already on the floor. It may have fallen while I was asleep. I checked it for cracks but there isn’t even a scratch…our floor has carpet. When I turned it on, the screen showed the yellow triangle with an exclamation point in the center. What does that mean? Related Problem: It just happened today, the screen of my Galaxy Tab S has an exclamation point inside a yellow triangle. This will show up when I plug the tablet to wall socket. If plugged to a computer, the exclamation point will not appear. What is the problem with my device? I hope you can help me fix it. Solution: The yellow triangle with exclamation point is actually overlapping the icon of an empty battery. It means that the battery has been totally depleted. There’s no other way to fix this but to plug your tablet in to charge. I understand you already tried plugging the charger in but the icon still appeared. Well, for a depleted battery, it will take several minutes to actually display the normal charging icon. Leave the phone to charge for 30 minutes and come back to turn it on. That will take care of the problem. Problem: Hi. My Galaxy Tab S 10.5 is about 3 months old. While I don’t have issues with it, there’s one thing it’s missing–Kids mode. My sister’s Tab S has kids mode and I wish to add that very same feature on my tablet but how? Honestly, I don’t know much about technology and my tablet remained as is when I bought it. I need your expertise on this. Thanks. Solution: When Galaxy Tab S was released, it didn’t have Kids Mode but units that were recently produced already have it. Kids Mode is just a pre-installed app, which means it comes with the firmware. That said, you can’t just download it from the Play Store or any other app stores. However, you can download the most recent firmware for your device that will allow you to install Kids Mode from Samsung servers. Tap the Home key and touch the Apps icon. Launch Settings and tap the General tab. Touch About tablet and then Software update. Tap update and a pop up will appear prompting you confirm your action to look for firmware updates. Now, if the most recent update has already been installed on your tablet, there must be a new app icon that will appear–it’s the Kids Mode icon. During the first run, you will need to download Kids Mode and install it. Once finished, you can now use the feature on your tablet. Suggestion: Hey Jonah. Actually Samsung released an official statement about this issue. According to the company, the problem is with the cover and not because the tablet is overheating. Who are we to say otherwise? The best thing to do is bring the tablet back to the nearest Samsung customer service center. Don’t get excited because it doesn’t mean you’ll get a new tablet. You may be given a new back cover. There’s nothing much we can do about it but for you, if you feel like the device is heating up excessively, give it time to rest and cool down to avoid overheating. Problem: Hello. I have a 64GB microSD card where all my photos are saved. I mounted it on my Galaxy Tab S 10.5 and it can’t read it. I’m not really sure what to do now but I just don’t want to lose all my photos. Is there a way to recovery them? How can I make my tablet read from the microSD card? Thanks. Troubleshooting: Perhaps the microSD was formatted other than the format readable by your tablet. I’m not really sure if the microSD card is damaged or corrupted but one way to recover your data is plug it in to a laptop. If the laptop can read from it then use that opportunity to backup everything in it. Once you’ve made a backup of your data, reformat the SD card using FAT32 format. However, if the laptop can’t read from it, there’s a very slim chance you can recover your photos…unless you know someone who knows how to work around corrupt or damaged storage devices. I’ve the problem in my tab like ” Unfortunately Touchwiz has stopped” error message is coming every time when the tab screen on. How to solve this issue please explain. Mine Tab S 8.4 is now suffering from major WiFi issues. Tried the mobile hotspot from my Note 4, no difference. Hi, my tab s 32gb 10.5 was losing charge too so I sent it back to samsung service, it was returned 5 weeks later apparently fixed with a major par replacement (not told what) , after 2 weeks of use and finding it drained battery rather quickly I sent it back again. I chased them many times and finally it was returned to me 6 weeks later with a new main board fitted. Battery life is now wonderful but I checked the storage and see they have installed main board of a 16gb tablet which is half the cost of the original tablet. Tablet nowmcrashes occasionally but usually ehen I am on facebook app so think fb app is to blame for that. Anyone sending tablet to service be careful you get the same size storage back as i anm now having issues with samsung to have the 32 gb main baord fitted. I cant use my tab more than 10mins without charger. My son’s Galaxy Tab 4 has gone to grey screen. Will not reboot, . Have tried all combos of bottom reset. Any suggestions? Was not dropped. Only 6 months old. The problem came back. The startup takes over five minutes, and then the WiFi is down “Trying to start…”. It turned out to be my 4GB memory card that caused all the problems. Immediately as I removed the card my pad got ready and WiFi was working again. The card shows no error except at startup. All I would like to know,would it be a good idea to install the Battery Doctor on my Samsung Tablet 8.4 S? Dear all, I just bought a samsung galaxy tab S 10.5 today. I opened google chrome and watch a video. I noticed that the area near and at the back of the samsung logo is hot. May I know is this normal or there is something wrong with this tablet? I watched the same video using Ipad 2 and Ipad 2 has no heating issue at all. Can someone enlighten me on what should I do? My samsung galaxy tab s have a proble.when i wanna taking a picture,the flashlight for camera does not function at all.why?help me and thank you. I have an 8.4 tab s and the screen is constantly dimmed with a greenish tint. I know how to dim and brighten the screen and I know about the adaptive ability, but no matter which I have set it on it stays dim. When I press hard on the screen in places it will brighten back up but it wont stay. Sometimes it will have white lines flash across the screen too. Any help would be great. Seems to be a problem with a lot of people including myself. Keeping it in powersave mode and half brightness keeps it running. Annoying given the huge price of this tablet. 1. it keep shut down randomly. 3. after i charge, the battery drops to 0% in seconds. This could be either a charging issue, or a battery issue. Contact support, the battery is under warranty and so is the repair. For me they were quick. Longest part is shipping there and back. My Galaxy Tab S 8.4 is prone to freezing. Eventually it froze and I couldn’t unfreeze it; nor could Best Buy’s Samsung service; nor could Samsung telephone service. I returned it to Samsung; they replaced a part (unspecified) and returned it to me with a new charger; they erased all my photos, my music, and my apps. I charged it up; installed the Kindle Android app and downloaded a few books; then it froze again when I was browsing the Web. I couldn’t unfreeze it. I called Samsung service and they couldn’t unfreeze it. It has again been returned to Samsung. It’s extremely annoying. So far I estimate that I have wasted at least 8 hours on this problem and it is still not fixed. I’ve been using PCs for more than 30 years and have never had to call customer service let alone return a computer to a vendor for service. Also I have been using Kindles since they were first introduced; I have never had to call customer service let alone return one to Amazon. Likewise Epson, HP, and Canon printers. All the distress calls on the Web from Samsung users whose tablets had frozen make it obvious that Samsung has a problem that has not been solved. I have used my Samsung tablet for 7 months. At first I loved it, It’s sleek, lightweight, and has an elegant screen with high resolution and vivid colors. But the honeymoon is over. It crashes too often and even freezes. It is too easy to accidentally press the back button. It’s impossible to remove the Samsung home page with its annoying promotions. I now wish that I had bought an iPod or a Kindle Fire 8.9. By the way, Samsung service has treated me well. They paid shipping costs both ways and their turn around time was very fast (4 days from when I shipped my tablet to them to when it was returned to my house!) That’s the good news. The bad news is that they have failed to fix the problem. Samsung service is amazing. They received my frozen Galaxy yesterday, repaired it, and returned it to me yesterday. But it remains to be seen if their fix lasts. When my galaxy tab s is fully charged and I turn it completely off, unplug the charger, it looses charge. Is this normal or defective? I pulled up the internet to vote on line for American Idol and it has froze, it won’t shut off at all, nothing is phasing it. my tab s 10.5 T-805 hangs and restarts when WiFi thethring is started,and then enters in to restarts loop,i done soft reset,hard reset and flash the the firmware through Odin but stil the problem is not resolved,after the reset the enter hangs in welcome screen and wifi become grey and the device hangs and restarts and after several times it starts WiFi and the process is completed but the device become very slow battery starts consuming and and CPU works all the time in the background cause the battery to drain what should i do?